Join us to solve the mystery of Kawasaki disease. Support this petition now! We believe Kawasaki disease is an ideal candidate for the Chan Zuckerberg Initiative (chanzuckerberg.com), whose support can propel research to cure, prevent and better manage this debilitating disease in our children’s lifetime. The most common cause of acquired heart disease in children and an emerging health threat in the developing world, Kawasaki disease causes inflammation of the coronary arteries. Left untreated, the disease leads to the formation of aneurysms in 25 percent of affected children. More than 40 years after Kawasaki disease was discovered there is still no diagnostic test for the disease, and the pathogen that causes it—whether toxin, fungus, or other agent—remains a mystery. However, a unique disease paradigm is emerging that consists of genetic predisposition and a wind-borne trigger (http://news.nationalgeographic.com/news/2014/05/140519-kawasaki-disease-japan-china-wind-science/). 1. CAUSE: Still unknown after 40 years with cases rising, the next level of understanding actively being studied will likely uncover preventions and a cure, with applications to other diseases as well. 2. DIAGNOSTIC TESTS: A particularly sinister disease which on the surface can resemble many illnesses with rash and fevers, Kawasaki disease requires timely diagnosis to minimize long-term and life-threatening coronary effects yet still lacks a specific diagnostic test. 3. AFFORDABLE AND AVAILABLE TREATMENTS: In developed countries, children are treated with high doses of intravenous immunoglobulin (IVIG), but this therapy is expensive and is simply unavailable in many regions of the world. 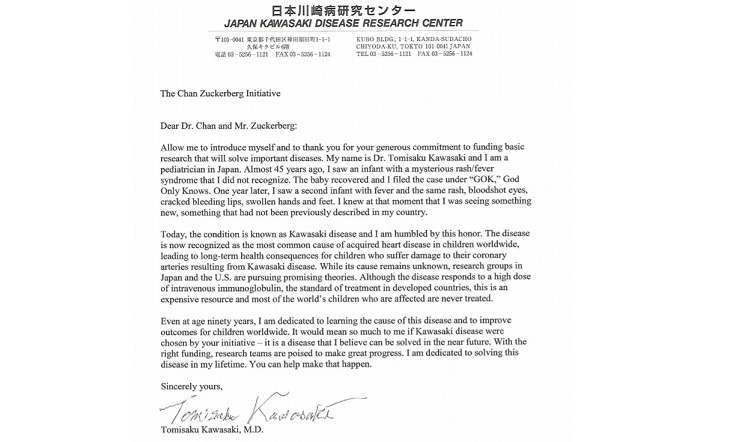 Because we believe that all children should grow up in a better world, that children deserve timely diagnosis and the most effective treatment, and that understanding the mechanisms of Kawasaki disease may lead to prevention and a cure, we the undersigned ask the Chan Zuckerberg Initiative to consider including Kawasaki disease as a candidate for their Initiative. We believe the Chan Zuckerberg Biohub, engineering and computer science support would propel current efforts to cure, prevent and manage Kawasaki disease. We also believe that at least two Kawasaki disease initiatives may have broad application beyond Kawasaki disease. Together, we will cure Kawasaki disease. The Join us to solve the mystery of Kawasaki disease. Support this petition now! petition to Chan Zuckerberg Initiative was written by Kawasaki Disease Research Center - San Diego and is in the category Health at GoPetition.